Why Is Rehab 28 Days? Why Consider a One-Month Treatment Facility? A 28- or 30-day rehabilitation center is one of the most common types of recovery programs. It usually includes an intake evaluation, a detox period, individual and group therapy and aftercare planning. One-month programs can help people overcome resistance to addiction treatment, allow them to detox from drugs and alcohol and let them reflect on their future. These programs may not offer enough treatment for people who have more severe addictions or who have relapsed. Consider the success rate, methods of treatment, staff expertise and cost of the program before making a decision. Sources differ on why 28 or 30 days is the standard stay in rehab. Whatever the reason, 28 or 30 days is the norm, and many insurance plans that pay for rehab will offer coverage for a month-long stay. An initial or intake evaluation of your addiction and any other mental or physical issues you may have. A team that can include doctors, nurses, psychiatrists and therapists will create a treatment plan for you based on your unique situation. A detox period.Detox is the process of allowing the body to rid itself of any remaining toxins while addressing withdrawal symptoms. Detox can include medical assistance, if necessary. Active addiction treatment. This phase of treatment will typically include both individual and group therapy, as well as addiction education, relapse prevention skills training and aftercare planning. During the course of 30 days, you will attend both group and individual therapy sessions, and you’ll also have the option to attend 12-step meetings that help recovered patients maintain their sobriety. These meetings and therapy sessions give you the opportunity to interact with people who are struggling with the same issues that you are. Many recovery centers provide both 28-day and 30-day drug recovery programs, which include similar services. 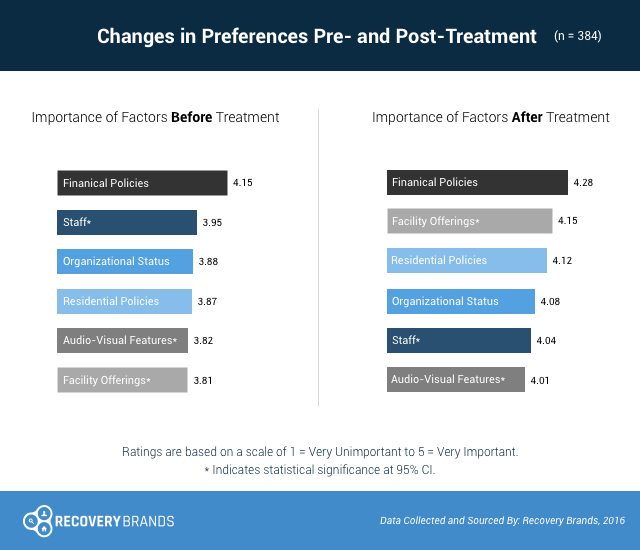 Data collected by Recovery Brands in 2016 show that those entering treatment for the first time and program graduates have significant differences in how they rate a program’s offerings. These aspects include quality of food, recreational options, and other amenities and comforts. Ask about a program’s amenities when looking for addiction treatment. Overcome uncertainty about treatment. A 30-day rehab program is often a starting point for individuals who are struggling with drug and/or alcohol addictions. Many people are reluctant about making a long-term commitment to their addiction. A shorter, one-month program helps hesitant individuals overcome their reluctance and be more willing to try rehab and recovery treatment. Detox from alcohol or drugs and reflect on your future. A one-month treatment facility allows you time to clear both your mind and your body of the addiction. You can safely detox and begin a path toward sobriety. A carefully designed and successfully followed course of treatment will help you to make well-informed decisions about your future once the treatment period has ended. At the end of your treatment program, your treatment team will evaluate you and may recommend more treatment time. You can continue to stay at the same program or work with the facility on a transfer to another program, if necessary. A 30-day rehab program may not be long enough for you to get the benefit of treatment, because you may spend the first few days to a week in detox. Longer programs give you a better opportunity to make real changes and build new habits. An addiction treatment professional may recommend a lengthier stay. If you have a long history of substance abuse, a longer program gives you more time to work through the causes of your addiction. Longer programs may be a better choice if you’ve had unsuccessful or interrupted recovery attempts after attending previous one-month programs. Understanding what to look for when choosing a residential drug treatment center can help you find the facility that is best suited to your needs or those of a loved one. One of the most important factors to consider when choosing an addiction recovery program for yourself or your loved one is the facility’s success rate. Treatment facilities are often willing to share their success rates and may also be willing to put you in touch with graduates of their programs. The price of a 30-day program varies depending on many factors. But the main factors are the duration of the program and the range of services provided. Thirty-day programs are usually cheaper than 60-day or 90-day programs and are more likely to be covered by insurance. Find out whether the facility accepts your insurance or offers any type of financing plan. Regular sessions with a therapist[/link]. Medical care for any pre-existing or new conditions. Find out how often you will meet with the psychiatric or medical staff. The program may not offer 24/7 access. You should also take into account the treatment methods used in the facility and whether those methods can address every aspect of you or your family member’s addiction. Because addiction often stems from a variety of factors, it is imperative that the treatment program addresses the apparent cause of the addiction as well as other issues you may be struggling with such as medical issues, concurrent mental health conditions, family or interpersonal relationship issues. Does the Program Treat Dual Diagnosis? Credentials of your potential treatment team. Do they have experience treating addiction? Staff mix and numbers. A staff-to-patient ratio closer to 1:1 means that you will be able to spend more time with the treatment staff. Whether the facility has prescribing or treating physicians. They can make sure you are receiving any medications you need and monitor you while you are taking them. Location is often an important consideration for many patients and their families. Traveling to a location that is free of distractions can be ideal for a recovering addict. On the other hand, you may want to stay close to home to stay connected to your family and friends, whose support can help with your recovery. It is never too late to get the help you need to overcome an addiction. If you’re looking for a 30-day rehab center near you, you can search the directory on this site’s homepage. Programs are organized by city and state, and you can read reviews written by people who actually attended the program. Pay attention to what people say about the quality of care, the staff, and how effectively it treated their addiction. You can also talk to friends and family who have experience or know people who have gone through rehab or ask your doctor or health care provider if they know of any reputable programs. Twelve-step programs can be another source for finding programs.
. Allen, B. (2016). How We Got Here: Treating Addiction In 28 Days. National Public Radio.
. Roan, S. (2008). The 30-day Myth. Los Angeles Times.